The London Olympics may have ended but the marketing rights are still in force – and will next year be enforced by the British Olympic Authority, according to Olympics minister Hugh Robertson. The responsibility to enforce the current marketing restrictions and protect the rights of Games Sponsors within the UK, transfers from the London Organising Committee of the Olympic and Paralympic Games (LOCOG) to the British Olympic Association (BOA) and British Paralympic Association, in January 2013. The BOA is continuing to work with the International Olympic Committee to develop a framework that allows suppliers to promote the work they undertook, balanced with the ability for sponsors to protect their rights of association with the Games. I will continue to monitor this to ensure British businesses can benefit as much as possible from their involvement in the Games. The commonly-quoted figure that 90% of torchbearer slots were “available to the public” is wrong, an analysis of official figures suggests. Based on the above numbers, commercial partner slots alone represent 11.4% of the total. Only 84% – not 90% – have been allocated to members of the public through various competitions and nomination processes. This represents 480 people who have missed out on promised slots. Organisations who are not Presenting Partners cannot allocate torchbearer slots publicly. However, as only Presenting Partners can accept nominations from members of the public, it’s not clear how other commercial partners would have been able to do so. It’s also not clear how London2012 could be confident that the extra 6% of places were “made available to the public”. We are awaiting a response explaining what processes were in place to monitor that. 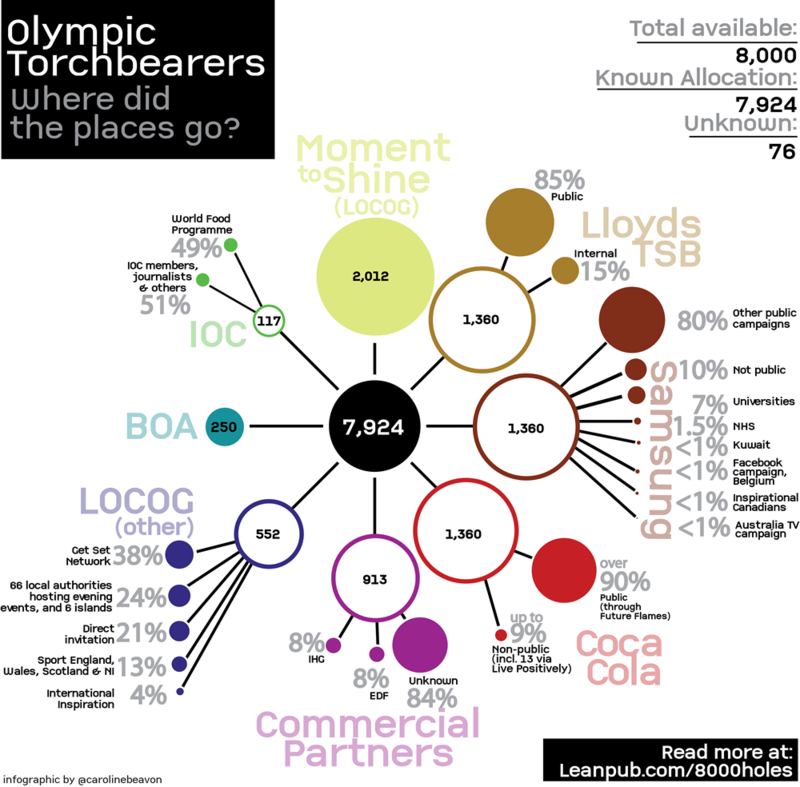 “90% of the 8,000 Torchbearer places are made available to the public through a number of channels, including the four public nomination campaigns from LOCOG, Coca-Cola, Lloyds TSB and Samsung. “The 16% share is made up of core stakeholders, for example, the IOC, BOA and commercial Games partners. Some of these stakeholders could also put forward members of the public, for example, long-term supporters of the Games and sports coaches. The spokesperson does not address the question of what processes were in place to monitor any allocation of places to ‘members of the public’ in this way. We have asked again for clarification on that process, specifically whether LOCOG can identify the 480 members of the public who may have been given torchbearer spaces through routes other than those previously outlined.